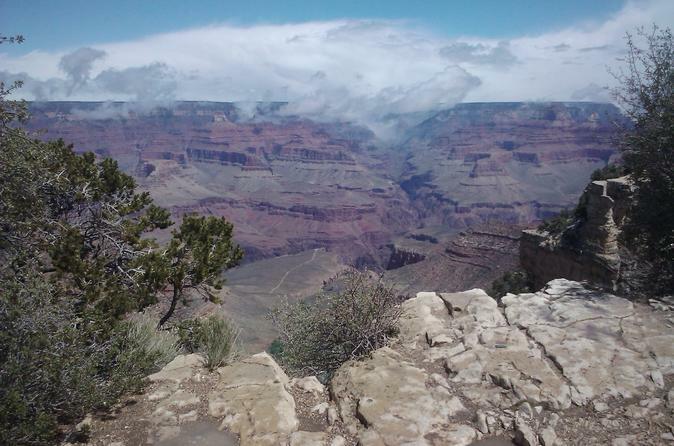 ** LISTED RATE IS PER GROUP** Enjoy a private tour to the Grand Canyon for your group of up to five guests. The tour can be customized from 10 to 14 hours. The itinerary can be tailored to suit your desires of what you would like to see along the route to the South Rim National Park. Major overlooks at the Grand Canyon with an expert guide. Sites such as Route 66, the Navajo Nation and the Painted Desert can be included. Option to add a pass through Sedona on the way to or from the Canyon. Enjoy just the right amount of narration and quiet time to take in the scenery and history as you travel to the Grand Canyon. A few possible spots to stop and visit on the way are the historic area of Route 66, Cameron Trading Post on the Navajo Nation. Option to add a pass through Sedona on the way to or from the Grand Canyon. Your expert guide will take you to the Grand Canyon for about a 3-5 hour visit (depending on your route choices), making sure you get all of the best views that the park has to offer. Some incredible overlooks can be seen from Grand Canyon Village, Yavapai Point, and Desert View Watchtower. Upon reserving, we will discuss with you tour options. Focus on the Canyon, free time for a hike, add a visit to Williams for Route 66 nostalgia, a visit to Cameron Trading Post on the Navajo Nation, and more. Admission to the National Park is included as well as bottled water and soft drinks. Meals are not included. Dining options can be discussed at confirmation. With a private tour, you have complete control of the itinerary, with the only limitation being hours in the day.